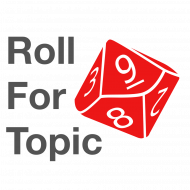 GMDiscussions.com is the home of the biweekly Roll for Topic podcast, in which your esteemed hosts Chris Salzman and Andy Rau discuss the ins and outs of running roleplaying games. In each episode, we talk about one topic chosen randomly from our regularly-updated d10 Table of Topics. We’re not expert GMs–we’re just two guys who love gaming. But between the two of us, and with the help of our amazing special guests, we hope to offer you some practical advice and encouragement you can use when GMing your games.